To the uninitiated, beautiful Lyon, France’s third largest city, is often thought of as a runner-up to Paris. But for many of those who live there—natives, former Parisians, and international residents alike—Lyon stands in a class of its own. Populated by a half-million, Lyon has all the usual offerings of a large, sophisticated city. With its wide assortment of excellent museums, theaters, and festivals, you’ll never suffer from a shortage of cultural events. It has an extensive and inexpensive public transportation system. There are farmers’ markets and restaurants galore. You’ll have your choice of doctors and pharmacies, bookstores, boutiques, galleries, and gyms… Lyon has it all. But there’s a reason why Lyon’s slogan is “Only in Lyon.” Outwardly, it might seem like your typical big city, but upon closer look you’ll see that it’s got dozens of fascinating elements that make it a truly unique and special place. First, there’s its beauty. Lyon is not a city of grim skyscrapers, perpetually clogged with traffic and impatient city-dwellers. Rather, it’s a tranquil city filled with elegant buildings painted in the warm yellow-orange-ochre hues of the Mediterranean. Not one but two rivers—the Saône and Rhône—cut right through the center of town, and locals often picnic, stroll, and bike along their banks. Few big, thriving cities offer the calm and loveliness of Lyon. Then there’s the food. Paris may be the capital of France, but Lyon is the capital of French gastronomy. The Lyonnais are deeply proud of this role, and take great pride in preparing their food with the highest quality local ingredients and the utmost care. The city has more than 2,000 restaurants—22 of which have at least one prestigious Michelin star—including several founded by Chef Paul Bocuse, legendary father of nouvelle cuisine and native son of Lyon. You’ll also find dozens of authentic Lyonnais bouchons, a special kind of home-style, low-cost restaurant that stuffs you with traditional (and very hearty) Lyonnais dishes until you’re ready to burst. Another unique feature? The public art. 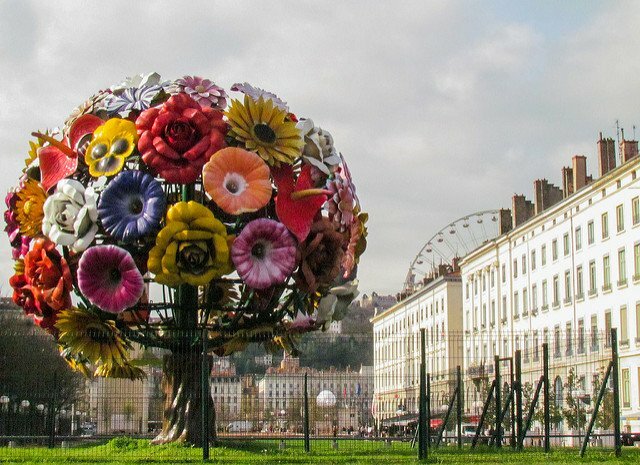 Throughout all corners of Lyon, you’ll find fantastic artwork, from sculptures to paintings. Lyon is best known for its gigantic trompe l’oeil (optical illusion) murals. These beautiful themed paintings look so realistic you might literally find yourself rubbing your eyes, uncertain whether you’re looking at a painting or real life. There’s also Lyon’s traboules, the fascinating secret passageways used by 18th-century silk workers to protect their delicate creations from the rain; “Vieux Lyon,” a beautifully preserved Renaissance neighborhood that’s a UNESCO World Heritage site; the “Fêtes des Lumières,” an annual festival where the entire city is transformed by colorful light displays and shows for three days; and the amazingly intact Roman ruins that you can explore on Fourvière Hill… There’s hardly the space to talk about it all here—you’ll have to visit Lyon and see for yourself why it’s so special. For anyone seeking all the advantages of a big French city with few drawbacks, Lyon is definitely the place to be. For a large city it has incredible generosity and calm. Its abundance of large parks (especially the sprawling Parc de la Tête d’Or) and river-side paths practically beg you to jog, cycle, or stroll, and many people do. If swimming is your thing, there are also 12 large indoor pools in the city, and a popular outdoor one near the Rhône. 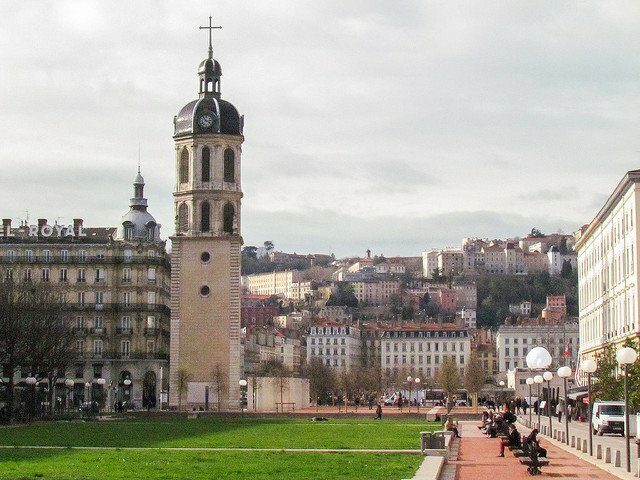 Lyon is also less than a two-hour drive away from the French Alps. Residents flock to the slopes during both summer and winter, for top-notch hiking and skiing. Lyon is also a perfect spot to explore the little medieval towns of the Rhone-Alps, including the exquisite town of Annecy, which looks like it’s straight out of a fairy tale. For the expat, Lyon is a particularly wonderful place to land. Thanks to its many cultural offerings, you’ll never lack for things to do. And if you don’t speak French, you’ve got many opportunities to speak and hear English. For example, it’s easy to find movie theaters that feature the latest English-language movies. There are also several Anglophone expats groups, from all-inclusive “meet up” groups to specific organizations, such as the Women’s Professional Networking Group and the American Club of Lyon. The cost of living in Lyon is the icing on the cake. Given all that Lyon has to offer, you’d think that the price of living would be sky-high, on par with Paris. But it’s not. Renting an unfurnished 850-square-foot apartment in one of the most elegant sections of Lyon costs about $1,200 to $1,400 per month (a comparable apartment in Paris would cost you at least $2,700). A smaller one-bedroom apartment in the same area would likely cost about $700 a month. Your total utilities cost will likely run about $140 per month, depending, of course, on your apartment size and usage. This typically includes heating, electricity, water, and garbage. The markets also offer very reasonable prices, especially given the high quality and freshness of the local foods. For example, you can get a couple of pounds of potatoes or onions for just over $2 and a dozen farm-fresh organic eggs for about $3. You can also dine out for great value, with a mid-range restaurant costing around $27 per person, including a glass of wine. And remember: this is Lyon. A mid-range restaurant here is bound to be excellent by any other city’s standard!